Last weekend I whipped up a batch of sun-dried tomato cream sauce in my Vitamix. I had a carton of heavy cream in the fridge plus I’d been wanting to use the Vitamix for something other than a smoothie for a change. When I saw the recipe for sun-dried tomato cream sauce in the Vitamix cookbook I knew that would be our dinner. We had just bought a huge jar of sun-dried tomatoes at Costco about a week prior! Of course the Vitamix recipe tried to keep it healthy. I did not. I swapped a cup of low-fat milk for heavy cream (mmmmm). I also left out the tomato paste only because I didn’t have any. 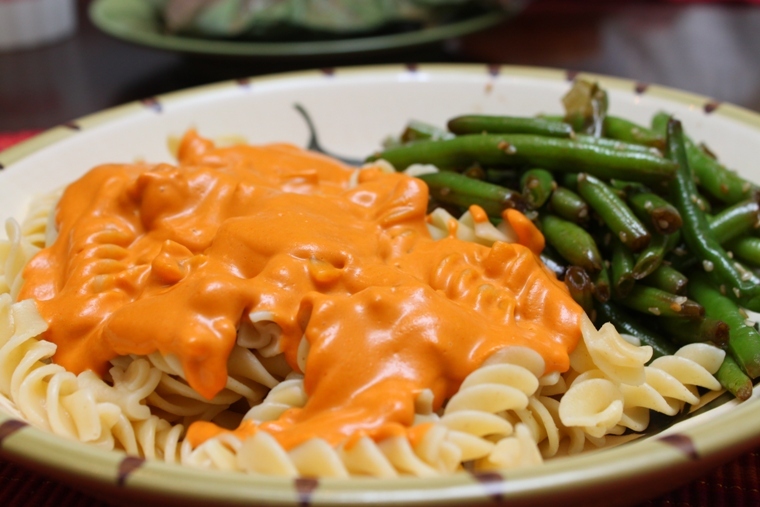 The result was an extremely delicious creamy sauce that was great tossed with pasta. Benzo cooked up some green beans on the side that were lightly boiled and then sauteed a bit with balsamic vinegar and sesame seeds. Side note – sorry for the not-so-great photography lately. It probably won’t get any better as the lighting in our new house is awful!